"NSA Insiders reveal what went wrong"
"The Watchdogs Didn't Bark: The CIA, NSA, and the Crimes of the War on Terror"
note: the 9/11 Commission report did not mention NSA's actions (and inactions) during the attack. James Bamford's book "The Puzzle Palace" revealed the existence of a National Security Agency department called the Defense Special Missile and Astronautics Center (DEFSMAC), now "Aerospace" center. DEFSMAC routinely probes the entire planet for indicators that a nuclear war has started. They have a goal to provide an urgent message to the President -- called "Critic" -- within less than 10 minutes. 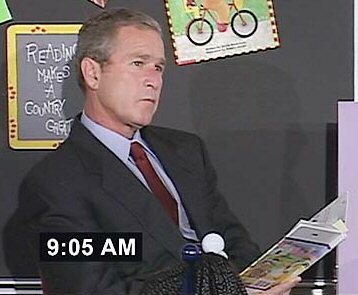 Even if one accepts the official lie that 9/11 was a surprise attack, there is no way to excuse the complete lack of response of the "President" (who read to second graders instead of calling for NORAD to intercept the hijacked planes). While George W. Bush was not the most sophisticated commander-in-chief this nation has ever had, this is irrelevant -- Vice President Cheney, the top leadership of the Pentagon and the intelligence agencies are extremely smart, at least in an IQ sense. The military's tremendous communication capabilities were more than adequate to start an effective defense of the National Capital Area, especially after the second tower had been hit. There is no excuse that the military's warning system was not used to get the alleged Commander in Chief back to Air Force One immediately upon hearing the news that "the nation is under attack." NSA works closely with the Pentagon's National Reconnaissance Office, which runs America's spy satellites. The NRO ran a "plane into building" exercise at its Virginia headquarters (near Dulles) during the attacks -- essentially a "fire drill" that evacuated staff during an extremely crucial moment in world history, the precise moments when the planes went off-course. The NSA admits to having intercepted messages on September 10 that were not translated until after the attacks, which serves a "limited hang out" purpose. This admission suggests no one in the government had foreknowledge, which is not true. It also sidesteps the issue of what NSA was doing during the attacks -- it is likely that the world's most sophisticated intelligence agency was not merely watching the events on television. Perhaps their electronic vacuum cleaners managed to collect communications during the hijackings that would answer questions about the precise roles of the war games in confusing the air defenses and the slow responses of NORAD (the failure to intercept the first three planes), and the role of the Presidential Emergency Operations Center (under the White House) that morning. evidence collected from the black boxes (at WTC and Pentagon) which would show what happened on the planes and how they were steered into the tops of the towers and nearly empty part of the Pentagon. what foreign governments and militaries were discussing around the time of the attacks might reveal further foreign involvements, including all warnings sent to the United States or Bush administration by foreign governments and assets. A serious effort to determine the full truth would have had access to this evidence. This website has no knowledge of any of this evidence (it is purely an "open source" effort), but it is not a secret that the NSA vacuums up these types of information. It would be surprising if this evidence was still intact in a form that would permit a future administration to perform a serious examination. The presentation below highlighted concerns from some of the most prominent NSA whistleblowers. They charged that overcollection of intercepts made it more difficult to find the intelligence that the hijackers were about to commit their atrocity, and afterwards, this "failure" was used for a massive civil liberties violation (bulk collection of as much communications from everyone as possible). Unfortunately, the event did not highlight the action or inaction of NSA during the attacks -- merely the alleged failure to connect the dots beforehand and the massive surveillance since then. Worth listening to but also worth considering how warning systems built over decades were not used that day. Their concerns about the swamping of NSA's signal intelligence systems also did not mention how FBI rank and file agents tried to stop the attack, there were concerns at CIA headquarters about the upcoming attack, the Defense Intelligence Agency's "Able Danger" program tracked the hijackers for years before 9/11, and foreign allies provided specific warnings the attack was about to happen. Featuring William Binney, Former Crypto-Mathematician, NSA; Kirk Wiebe, Former Senior Analyst, NSA; Edward Loomis, Former Computer Systems Analyst, NSA; Thomas Drake, Former Senior Executive Service Member, NSA; and Diane Roark, Former Professional Staff Member, House Permanent Select Committee on Intelligence; moderated by Patrick Eddington, Policy Analyst in Homeland Security and Civil Liberties, Cato Institute. Almost 17 years after al Qaeda's attacks on America, many key questions remain unanswered. Chief among them: why did America's National Security Agency (NSA) fail to detect and thwart the attacks? Has the NSA as an institution learned the right lessons from this national tragedy and changed accordingly? What has Congress done—or failed to do—since the attacks to improve intelligence collection while still protecting American's constitutional rights? "The NSA and the Road to 9/11: Lessons Learned and Unlearned" brings together five former federal officials who were key players in the effort inside the NSA and on Capitol Hill to prevent the 9/11 disaster and to reform NSA's approach to surveillance in the years after. If you can't make it to the event, you can watch it live online at www.cato.org/live and join the conversation on Twitter using #CatoNSA. Follow @CatoEvents on Twitter to get future event updates, live streams, and videos from the Cato Institute. In a memo to President Obama, former National Security Agency insiders explain how NSA leaders botched intelligence collection and analysis before 9/11, covered up the mistakes, and violated the constitutional rights of the American people, all while wasting billions of dollars and misleading the public. At a hearing of the Senate Judiciary Committee on October 2, Senator Feinstein showed her hand when she said: “I will do everything I can to prevent this [NSA’s bulk] program from being canceled.” Declaring that 9/11 “can never be allowed to happen in the United States of America again,” Feinstein claimed that intelligence officials did not have enough information to prevent the terrorist attacks. Mr. President, we trust you are aware that the lack-of-enough-intelligence argument is dead wrong. Feinstein’s next dubious premise – that bulk collection is needed to prevent another 9/11 – is unproven and highly unlikely (not to mention its implications for the privacy protections of the Fourth Amendment). Given the closed circle surrounding you, we are allowing for the possibility that the smell from these rotting red herrings has not yet reached you – even though your own Review Group has found, for example, that NSA’s bulk collection has thwarted exactly zero terrorist plots. The sadder reality, Mr. President, is that NSA itself had enough information to prevent 9/11, but chose to sit on it rather than share it with the FBI or CIA. We know; we were there. We were witness to the many bureaucratic indignities that made NSA at least as culpable for pre-9/11 failures as are other U.S. intelligence agencies. We prepared this Memorandum in an effort to ensure that you have a fuller picture as you grapple with what to do about NSA. What follows is just the tip of an iceberg of essential background information – much of it hidden until now – that goes to the core of serious issues now front and center. The drafting process sparked lively discussion of the relative merits of your Review Group’s recommendations. We have developed very specific comments on those recommendations. We look forward to an opportunity to bring them to your attention. We write you with a sense of urgency looking toward your upcoming decisions regarding the activities of the National Security Agency. 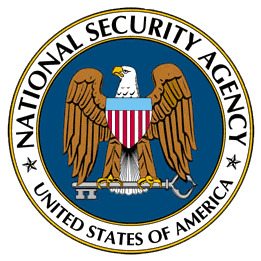 We the undersigned (William Binney, Thomas Drake, Edward Loomis, and Kirk Wiebe) worked with NSA for a total of 144 years, most of them at senior levels. Our mission required the highest technical skills to keep the country safe from foreign enemies, while protecting the privacy rights of U.S. citizens under the Fourth Amendment to the U.S. Constitution. from James Bamford, "Body of Secrets: Anatomy of the Ultra-Secret National Security Agency"
Among the most secret organizations in OPS 1 is the Defense Special Missile and Astronautics Center (DEFSMAC). At the entrance to Room 1E069 is the organization's seal: an orbiting satellite and a patch of stars above the earth. Even within the intelligence community, DEFSMAC (pronounced "deaf-smack"), a joint project of the NSA and the DIA, remains little known. Robert McNamara established the organization on April 27, 1964, largely as a result of the ,Cuban missile crisis, in order to evaluate foreign missile activity and threats. "You didn't want NORAD [the North American Air Defense Command] fooling around in technologies that they didn't understand, or trying to evaluate a bunch of raw data, so DEFSMAC was put in," said Lieutenant General Daniel O. Graham, a former director of the Defense Intelligence Agency. Since its beginning, the organization has always been headed by an NSA civilian, with a DIA colonel as deputy director. Today the organization operates as the nation's chief warning bell for the launch of foreign rockets-whether in ballistic missile tests by China or North Korea, or in an attack from a rogue launch site in Russia. The focal point for "all source" intelligence -- listening posts, early warning satellites, human agents, seismic detectors -- on missile launches, DEFSMAC provides the "initial analysis and reporting on all foreign space and missile events." As other organizations have shrunk with the end of the Cold War, DEFSMAC has more than doubled its size, to more than 230 people, eighty-five of whom staff a new operations center. Where once DEFSMAC had only Russia and China to monitor, its widely dispersed targets now also include India, North Korea, Iran, Israel, and Pakistan. DEFSMAC watches the earth as a physician listens to a heart, hoping to detect the first irregular beat indicating that a missile is about to be launched. "It has all the inputs from all the assets, and is a warning activity," explained one former NSA official. "They probably have a better feel for any worldwide threat to this country from missiles, aircraft, or overt military activities, better and more timely, at instant fingertip availability, than any group in the United States." According to another former NSA official, "DEFSMAC not only detects them but ... [also has] the capability to relatively immediately determine what kind of a vehicle was launched, what trajectory it's on, and based on all these parameters they can say either it's a threat or it's not a threat." A recent director of DEFSMAC, Chary Izquierdo, referred to her organization as "the [nation's] premier missile and space intelligence producer." Once DEFSMAC receives a tip-off, an indication that a launch is soon to take place somewhere in the world, a complex chain of events is set in motion. For example, in October 1998 NSA satellites and listening posts, such as those in Germany, picked up indications that Russia was about to test a new missile from its launch site in Plesetsk, in the country's far northwest. Electronic signatures intercepted from Russian instruments being prepared to measure the rocket's telemetry gave one of the first clues that the missile was a Topol-M single-warhead intercontinental ballistic missile. Signals intelligence satellites also likely picked up phone conversations between the launch site and Moscow. Upon receiving such indicators, DEFSMAC officials would immediately have sent out near-real-time and in-depth, all- source intelligence alerts to almost 200 "customers," including the White House Situation Room, the National Military Command Center at the Pentagon, the DIA Alert Center, and all listening posts in the area of the launch site. At the same time, elsewhere within DEFSMAC, analysts would have closely monitored all intercepts flooding in from the area; examined the latest overhead photography; and analyzed data from an early-warning satellite 22,300 miles above the equator. This satellite would have been first to spot the missile's rocket plume and signal back to earth that a launch had occurred. Another system bears critically important intelligence from an intercept operator at a listening post in a distant part of the world straight to the president of the United States at breakneck speed. The surprise launch by the Soviet Union of Sputnik in 1957 caused an earthquake within the intelligence community. At the time, it took an average of 8 hours and 35 minutes for a message containing critical intelligence to reach the White House. President Eisenhower demanded that the time be reduced to minutes. At a National Security Council meeting on August 27, 1958, attended by Eisenhower, CIA director Allen Dulles agreed that "there was little purpose in developing critical intelligence overseas unless we had the communications means to insure its rapid transmission to Washington." A month later, in a meeting in the Oval Office with Eisenhower, Tordella proposed a system known as CRITICOMM. After Tordella outlined the costs and benefits, Eisenhower turned to the deputy secretary of defense and said, "Do it." Within six months NSA was able to reduce transmission time from more than 8 hours to 52 minutes. In another six months the agency was able to have a CRITIC, or critical intelligence message, on Eisenhower's desk within a brief thirteen minutes, regardless of where it had originated. Eventually the time shrunk to between three and five minutes. [emphasis added - my comment: did the CRITIC system get used on September 11, and why was it not used to get President Bush out of the elementary school and into his ostensible role as Commander in Chief? In the unlikely event there is ever an official investigation of 9/11 suppressed warnings and standdowns, I recommend the recent book "The Watchdogs Didn't Bark" as a good place to start. The title is from a Sherlock Holmes story. The detective figured out a burglar's identity because a watchdog did not bark because he knew the person. "The authors lay bare… an intelligence failure of historic proportions." In 2009, documentarians Duffy and Nowosielski arrived at the offices of Richard Clarke, the former counter-terror adviser to Presidents Clinton and Bush. There, for the first time, Clarke boldly accused his friend and one-time Central Intelligence Agency director George Tenet of "malfeasance and misfeasance" in the pre-war on terrorism. Thus began an incredible—never-before-told—investigative journey of intrigue into how the fall-out from a covert decision within America's intelligence community about two future September 11th hijackers may have come to secretly define the terror wars and launched a "war on whistleblowers." The Watchdogs Didn't Bark details that story, unearthed over a ten-year investigation. Following the careers of a dozen counterterror employees of the US government from the late 1980s to the present, the book puts the government's systems of accountability under a microscope. How did current CIA director Gina Haspel manage to climb her agency's ladder with such speed? The authors examine the merits of decades of serious accusations made against some of her key allies. What can explain how two key Al Qaeda plotters—operating inside the United States for nearly two years before the 9/11 tragedy—could fall onto the radars of so many US agencies without any of them succeeding in stopping the attacks? The authors find unexpected answers and a system all-too-easily manipulated against the best interests of the American people. Taking readers on a character-driven account of how the true lessons of the September 11th attacks were cynically inverted to empower the state, an alarm is raised which is more pertinent today than ever before. Ray Nowosielski is a documentary filmmaker and journalist who has written for Salon and Truthout and contributed to investigations by Newsweek, The Daily Beast, and The Intercept. He has directed several documentaries, including 2006's critically acclaimed Press For Truth, and has produced for HBO, Amazon, Discovery Impact, and Morgan Spurlock. He lives in New York City. John Duffy is a writer and activist. He produced the documentary Press for Truth as well as the investigative podcast Who Is Rich Blee? He has worked extensively in the environmental movement to fight tar sand extraction, fracking, and logging on public lands. His anonymous essays critiquing the contradictions of big systems and their fallout on ecology and society appear regularly in a variety of media. He currently lives in a quiet cabin in the Midwest with his family. "Stories of characters in the dark corners of the bureaucracies, where the secrets are kept… Duffy and Nowosielski name names and hold people to account. If only our government had the courage to do the same." "A devastating portrait of an agency that is almost singularly committed to its own impunity… Has any government agency, anywhere, been as successful as the modern CIA in avoiding accountability for its grotesque failures and abuses, including grave violations of human rights?" "A detailed, comprehensive indictment for prosecution of these unpunished masters of elaborate deception, wielding secrecy as the main weapon." "Snapshot of the much larger blueprint of malfeasance that ran rampant across the US government… Having been personally affected and engaged on these issues for the past seventeen years, even we learned new pieces of disturbing and damning information… A must read." —PATTY CASAZZA, MONICA GABRIELLE, MINDY KLEINBERG, LORIE VAN AUKEN, "The Jersey Widows"
It's easier to bury uncomfortable facts than to confront them. So this September 11, the ceremonies marking the 2001 attacks on New York and Washington, D.C., will simply honor the dead. In Manhattan, tourists and mourners will gather where the World Trade Center Towers once stood, lowering their heads in memory of the 2,606 who perished there. The services won't reflect the view that the attacks might well have been prevented. "It's horrible. We still don't know what happened," said Ali Soufan, one of the lead FBI counterterrorism agents whom the CIA kept in the dark about the movements of the future Al-Qaeda hijackers. To Soufan and many other former national security officials, the unanswered questions about the events leading up to the September 11, 2001, attacks dwarf those about the assassination of John F. Kennedy, because "9/11 changed the whole world." It not only led to the invasions of Afghanistan and Iraq, the fracturing of the Middle East and the global growth of Islamic militantism but also pushed the U.S. closer to being a virtual homeland-security police state. "I am sad and depressed about it," said Mark Rossini, one of two FBI agents assigned to the CIA's Osama bin Laden unit, who says agency managers mysteriously blocked them from informing their headquarters about future Al-Qaeda plotters present in the United States in 2000 and again in the summer of 2001. "It is patently evident the attacks did not need to happen and there has been no justice," he said. The authors of a new book on 9/11 hope to refocus public attention on the cover-up. Thoroughly mining the multiple official investigations into the event, John Duffy and Ray Nowosielski find huge holes and contradictions in the official story that 9/11 was merely "a failure to connect the dots." But Duffy and Nowosielski come to the story with a noteworthy credential: In 2009 they scored an astounding video interview with Richard Clarke, a White House counterterrorism adviser during the Bill Clinton and George W. Bush administrations. In it, Clarke raged that top CIA officials, including director George Tenet, had withheld crucial information from him about Al-Qaeda's plotting and movements, including the arrival in the U.S. of future hijackers Khalid al-Mihdhar and Nawaf al-Hazmi. In The Watchdogs Didn't Bark: How the NSA Failed to Protect America From the 9/11 Attacks, the authors assemble a compelling case of a government-wide cover-up of Saudi complicity in the affair. In 2002, Tenet swore to Congress that he wasn't aware of the imminent threat because it came in a cable that wasn't marked urgent—and "no one read it." But his story was shredded five years later when Senators Ron Wyden and Kit Bond forced loose an executive summary of the CIA's own internal investigation of 9/11, which stated that "some 50 to 60 individuals read one or more of the six Agency cables containing travel information related to these terrorists." "I believed, for the longest time, that this was one or two low-level desk officers who got this [information about Hazmi and Mihdhar] and somehow didn't realize the significance," he told them. But "50—five oh—50 CIA officers knew this, and they included [Tenet and] all kinds of people who were regularly talking to me? Saying I'm pissed doesn't begin to describe it." All these years later, it's still unclear why the CIA would keep such crucial details about Al-Qaeda movements from the FBI. Clarke and other insiders suspect that the spy agency had a deeply compartmented plan in the works to recruit Hazmi, Mihdhar and perhaps other Al-Qaeda operatives as double agents. If the FBI discovered they were in California, the theory goes, it would have demanded their arrest. When the CIA's recruitment ploy fizzled, Tenet and company hid the details from Clarke lest they be accused of "malfeasance and misfeasance," he said. It's the only logical explanation for why the presence of Hazmi and Mihdhar was kept from him until after the attacks, Clarke said. "They told us everything—except this," he says in the video. Tenet and two of his counterterrorism deputies, Rich Blee and Cofer Black, issued a statement calling Clarke's theory "reckless and profoundly wrong." But now Clarke has company. Duffy and Nowosielski found other key former FBI counterterrorism agents and officials who have developed deep doubts about Tenet's story. The only element they disagree on is which officials were responsible for the alleged subterfuge. "I think if there were some conscious effort" not to tell the bureau what was going on, Dale Watson, a former FBI deputy chief of counterterrorism told them, "it was probably" carried out below Tenet, Blee and Black, by managers of the CIA's Osama bin Laden unit. But Pat D'Amuro, an even more senior former FBI counterterrorism official, told them, "There's no doubt in my mind that [withholding the information] went up further in the agency" than those managers. "And why they didn't send it over, to this day, I don't know why." And then there's the continuing mystery of Saudi complicity with the hijackers. Duffy and Nowosielski offer a tightly focused update on what's been learned about Saudi support for Al-Qaeda in recent years. Back in 2004, the official 9/11 Commission said it found no evidence that the "Saudi government as an institution, or senior Saudi officials individually funded" Al-Qaeda. A year later, the highly redacted CIA inspector general's report cracked open another window, saying that some agency officers had "speculated" that "dissident sympathizers within the government" (i.e., religious extremists) may have supported bin Laden. Subsequent investigations have revealed that officials from the kingdom's Islamic affairs ministry were actively helping the hijackers get settled in California. "Saudi intelligence has admitted that they knew who these two guys were," Andrew Maloney, an attorney for families, told Newsweek last week. "They knew they were Al-Qaeda the day they arrived in Los Angeles. So any notion from the Saudi government saying, 'Oh, we just help out all Saudis here' is false. They knew. And the CIA knew." The kingdom has turned over some 6,800 pages of documents, "mostly in Arabic," that Maloney's team is in the process of translating. "There's some interesting things in there," he said, "and some clear gaps." He said he'll return to court in October to press for more documents. He also wants to depose Saudi officials, particularly Fahad al-Thumairy, a former Los Angeles consular official and imam of a Culver City, California, mosque attended by the hijackers. In 2003, Thumairy was intercepted after he landed in Los Angeles on a flight from Germany and deported from the U.S. "because of suspected terrorist links." But he still works for the government in Riyadh, Maloney said. "Can you believe that?" In April, Maloney subpoenaed the FBI for documents on Thumairy and Omar al-Bayoumi, a suspected Saudi spy in the U.S. who was also in contact with the hijackers. The bureau has not responded, so on September 11 he plans to file "a formal motion to compel the FBI" to produce the documents. His motion follows a sworn statement by Steven Moore, the FBI agent who headed the bureau's investigation into the hijacking of the plane that flew into the Pentagon, charging the 9/11 Commission with misleading the public when it said it "had not found evidence" of Saudi assistance to Hazmi and Mihdhar. "There was clearly evidence that Thumairy provided assistance to Hazmi and Mihdhar," Moore wrote. And "based on the proof in our investigation," he added, "Bayoumi himself was a clandestine agent and associated with radical extremists, including Thumairy." Moore's statement was first reported by the Florida Bulldog, a Fort Lauderdale news site that has been investigating the hijackers' contacts with flight schools. "To my knowledge," Moore stated, "Thumairy has never been the subject of a genuine law enforcement interview conducted by the actual agents who investigated him." Maloney's additional targets are other FBI, CIA, State Department and Treasury Department personnel and documents. "There are a lot of people, former agents—I won't identify who or what agencies—who have talked to us," he said, but others, especially in the CIA's bin Laden unit, "will never talk to us or will only talk to us if they are given some kind of blanket immunity." Getting access to them, he said, would probably require an executive order from President Donald Trump—an unlikely outcome given his administration's strong backing for the Saudi monarchy. There may be public support for Maloney's endeavors. A 2016 poll found a slight majority of Americans (54.3 percent) believe that the government is hiding something about the 9/11 attacks. Then again, a considerable number of 9/11 "truthers" embrace conspiracy theories positing that the attacks were "an inside job" by the Bush administration and/or Israel and abetted by explosives planted in one of the World Trade Center towers. Terry Strada, a leader of the group 9/11 Families & Survivors United for Justice Against Terrorism, will mourn again this year, but not at the site where the towers once stood and her husband died. She plans to attend "a private service" at the Shrine of St. Joseph in Stirling, New Jersey, which she said has "a beautiful and solemn space" dedicated to all who died in the 9/11 attacks. But she is also full of fury at the government's refusal to release all it knows about the run-up to the attacks. "It's very sad that we're still being kept in the dark about it. It's frustrating. It angers me," she told Newsweek. "It's a slap in the face. They think they're above the law and don't have to respond to the families—and the world. It's disgusting." But she evinces even more disdain for the Saudis. Responding to Secretary of State Mike Pompeo's August 20 message "wishing Muslims around the world a blessed Eid al-Adha," she tweeted, "Seriously??? "The Saudis promote & finance the most virulent hatred toward Americans than any other nation. Murdered 3,000 on Sept 11." The "9/11 families," she wrote, "will #NEVERFORGET. #FreeTheTruth"
"The power to see to it that regular government operations don't occur is one of the greatest controls over power you can wield in a government." General Hayden told a lie, and it's a whopper. Magicians wield secrecy on the theater stage in the service of illusions. Spies likewise wield illusion on the world stage in the service of secrecy. So it is with the events behind the attacks of 9/11 where those who question the official story are derided as conspiracy theorists. Thanks to the investigative digging of reporter James Bamford, with the assistance of NSA whistleblowers like Thomas Drake and Kirk Wiebe, the 9/11 crowd can now point to a conspiracy fact: an incredible cover-up that goes all the way to the top of the American intelligence community. In a recent piece published by Foreign Policy Bamford examines a phone call to a clandestine operations center run by Osama bin Laden in Yemen during March of 2000. The phone call was dialed by one of the 9/11 hijackers, Khalid al-Mihdhar, from his apartment in San Diego. In fact, there were a number of such phone calls made by 9/11 hijackers living in San Diego. Why didn't our security services immediately launch investigations? According to then director of the NSA, Michael Hayden, the NSA was unable to determine the geographic origin of these calls despite the fact that the phone line in Yemen (967-1-200-578) was under intense scrutiny by NSA. The Yemen number was tracked using a form of surveillance known as "cast-iron" coverage where dedicated resources were allocated to continuously monitor the line 24/7. Years later, in 2014, Hayden claimed that technical difficulties prevented exact geolocation. By the way, this is the same justification that he relied on post-9/11 to help institute the bulk collection program for phone metadata. Hayden told interviewers from Frontline: "Two guys, Nawaf al-Hazmi and Khalid al-Mihdhar, living in San Diego… come to the United States, call home, call Yemen, call a safe house in Yemen seven times. We intercepted every one of the calls, right? Nothing in the physics of the intercept, nothing in the content of the call told us they were in San Diego. If we'd have had the metadata program, OK, if we'd have had that basket of stuff and that phone number of that safe house in Yemen, which we knew, and we would have walked up to that metadata and said, "Hey, any of you guys talked to this number in Yemen?" those numbers in San Diego would have popped up." James Bamford, himself a former NSA whistleblower, digs into Hayden's assertions. Leveraging the technical expertise of former NSA insiders he unearths an unsettling find. The narrative spun by Hayden is "an absolute lie." The NSA knew damn well that these calls were coming from San Diego. According to former NSA senior executive Thomas Drake: "Every number that comes into that switchboard, if you're cast-iron coverage on that switchboard, you know exactly what that number is and where it comes from.… You know exactly—otherwise it can't get there." Former NSA senior analyst Kirk Wiebe expounds on Drake's counterpoint, noting that telephone communiques are bundled with the bits of information necessary to bill the correct phone company: "You know the phone numbers involved, who's making the phone call, and who it's going to because the billing system has to have that metadata to charge you." So Drake, Wiebe and other NSA veterans charge that Hayden is full of it. That the NSA was aware of terrorists in San Diego phoning home to Yemen. This raises some important questions. For example, how on earth could an intelligence agency with billions in resources neglect to follow up on these calls? From people whom they knew to be associated with bin Laden? How could internal security services not request court authorization for wiretaps and launch an inquiry? It's a given that any investigator worth their salt would've linked and correlated the San Diego callers to other 9/11 terrorists in the United States and almost certainly put a halt to the operation. There may be those who point to incompetence and embarrassment as a possible explanation. Such people would argue that the NSA is an agency like other agencies made up of people and that people are fallible; the San Diego call was somehow overlooked or was accidentally lost in the commotion of the NSA's monolithic bureaucracy. Your author questions this account, as it would indicate an organization that's way beyond dysfunctional. Recent disclosures by WikiLeaks describe economic espionage by the United States which depict an NSA that's more than capable of performing SIGINT missions. Other Snowden-era documents also indicate that the NSA runs a world class spy outfit. Consider also that foreign countries like Germany are just itching to be brought into the Five Eyes fold. No keystone cops here, no sir! Precluding ineptitude leaves us with a more disturbing scenario. That the calls from San Diego were intentionally ignored. In other words certain people didn't want them investigated. Thus raising even more disturbing questions. And from this point we must reluctantly travel down the rabbit hole. An entrance to a wilderness of mirrors, a place defined by secrecy and illusion traveled heavily by the tricksters of the American Deep State. Bill Blunden is the author of several books, including "The Rootkit Arsenal" and "Behold a Pale Farce: Cyberwar, Threat Inflation, and the Malware-Industrial Complex." He is the lead investigator at Below Gotham Labs. On September 12, 2001, Bill Binney snuck back into work at the NSA dressed like cleaning staff so he could try to help understand who had attacked the United States. A top NSA mathematician, Binney had rolled out a sophisticated metadata analysis system called ThinThread, only to have it canceled less than a month before 9/11. Top executives at the agency had decided a clunky program called Trailblazer, contracted out to the intelligence contractor giant SAIC, would be NSA's future, not the cheaper, more effective and privacy-protective ThinThread. While NSA Director General Michael Hayden had sent most NSA staffers home on 9/11 and the day after —hence Binney's disguise — the contractors were hard at work. As Binney describes in "A Good American" -- a documentary about Binney due for wider release in September -- some contractors working in his unit had gotten a warning. "While I was in there trying to look at the material on my computer, the president of the contracting group that I had working on ThinThread came over to me and said that he'd just been in a contractor meeting" with a former top SAIC official who moved back to NSA, supporting Trailblazer. The contractors, it turns out, were warned not to embarrass companies like SAIC, which (the implication is) had just failed to warn about the biggest attack on the United States since Pearl Harbor. "Do not embarrass large companies," the former SAIC manager, according to Binney, said to the other contractor. "You do your part, you'll get your share, there's plenty for everybody." Stay quiet about the failures that led to 9/11, and you'll be financially rewarded. It turns out there was plenty for SAIC and the NSA executives who had backed them to be embarrassed about. Binney and a bunch of close associates quit NSA when the Administration rolled out a new, illegal wiretap program called Stellar Wind in the weeks after 9/11. But another senior NSA official, Thomas Drake -- an ally of Binney's -- decided to run the data already in NSA's possession against ThinThread some months later to see whether ThinThread could reveal anything about the attack. Let's "find out if there's any information of the 9/11 attack that we should have known about but didn't," in Drake's words. As Drake describes in the film, "We discovered critical intelligence, al Qaeda and associated movement intelligence that had never been discovered by NSA. They didn't even know that they had it in their databases." There were details about people not otherwise identified fleeing after the attack, about subplots that hadn't succeeded. The NSA's clunky systems not only didn't prevent the attack, as Drake's test of ThinThread suggests Binney's program might have, but it couldn't identify relevant data about the attack in NSA's possession even after the attack. The outlines of this story -- like another story of missed details about 9/11, the 28 pages from the Joint Congressional Inquiry into the attack, which are finally being declassified -- have been known for years. Binney, his associates, and Drake complained to the Defense Department's Inspector General. The IG completed his investigation in 2004 and largely confirmed the NSA whistleblowers' complaints. Trailblazer got shut down as a tremendous waste. The government attempted, but failed, to prosecute Drake in conjunction with leaks to the New York Times about the illegal wiretap program. We've gotten hints of the ominous details of missed intelligence, too. Drake has alluded to what he found in his review of the data and how he tried to tell the committees investigating the response. He has hinted that that evidence, like those suppressed 28 pages, involves information the intelligence community should have known -- and shared. But that has all been, largely papered over, and the Trailblazer IG report remains almost as redacted as those 28 pages implicating one of our closest allies. After 15 years, apparently, it's finally okay to talk about how closely implicated our friends the Saudis are in the 9/11 attack. If we can handle those details, perhaps maybe we're finally also adult enough to learn how big contractor graft prevented us from learning the details in the first place? While the Executive prepares those 28 pages on Saudi involvement in 9/11, it should also prepare that IG report showing how graft made NSA less effective and more intrusive for public release.